In this piece from Mountaineer magazine, Sheri Hogshead shares a story from a Global Adventures trip to Italy. A few years ago, I took a group of Nordic skiers to the Dolomites in Italy. 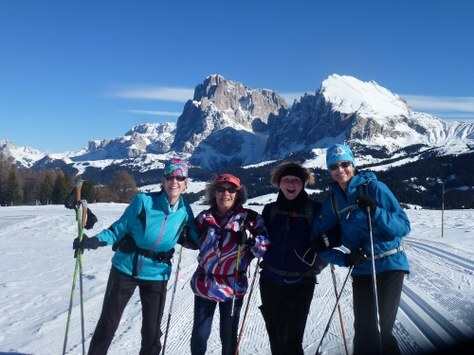 One couple in my group was looking forward to celebrating a significant anniversary in Florence and Rome following our ski adventures. We had been in the Dolomiti for about 10 days and, on this day, had enjoyed a rigorous mountain ski. After lunch and a ski back to a side valley where our path crossed a road, the anniversary couple decided to take the rest of the day off and bus back to the hotel. On this trip, we could choose to ski through the connecting valleys back to our hotel or take a bus if we were tired. The rest of our group decided to head up valley and take another downhill run before skiing back. When we came around to the bus stop a few hours later, we found the anniversary husband running up and down the road. Upon catching sight of us, he asked us to help him look for his wallet, which he thought he had lost getting on the bus. We looked everywhere — in a trash bin at the bus stop, along the road. I even asked at a nearby restaurant if anyone had turned anything in. No luck. He took the bus back to our village so that our hotel owner could help him fill out a police report. As the rest of us skied back, I contemplated how we could assist our friends in amassing the funds to complete their travels alone in Rome and Florence, since I felt quite certain that, when his credit cards were canceled, hers would be also. I pretty much had this figured out as we approached our hotel. At that point, we saw our friend exit the hotel with an Italian gentleman. We soon learned that this gentleman had found the wallet under his seat on the bus. He opened the wallet and found a card from our hotel. He got off the bus in our village and walked to our hotel. He was looking at the drivers license photo from Washington State when he saw our friend returning from his fruitless search at the bus stop. It certainly was a happy conclusion and our Italian hero would take no reward – not even a bottle of wine. After shaking our hands, he returned to the bus stop and waited for the next bus that would take him home for the evening. The lucky find wasn’t the wallet, but the kindness of a stranger. We’ve found helpful folks like this during all our travels. I advise my trip participants to always carry their accommodation itinerary with them at all times. In that event, even if that gentleman had found the wallet a few days later, he would have known the name of the next hotel destination. Take a few precautions and enjoy your travels and the people you meet along the way. Check out our upcoming Global Adventures trips here.